Has the record-breaking heat of the Texas summer of 2009 got you down? 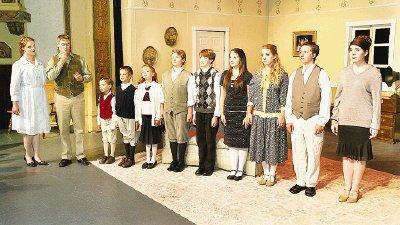 If you think some cool and breezy family entertainment would be a relief, then you might want to consider a trip to Conroe’s elegant Crighton Theatre for the current Stage Right Production of Cheaper By the Dozen. Cheerfully directed by Jillian Nolan, this production was adapted for the stage by Christopher Sergel. By way of an interesting theatrical device, Cole Thompson and Holly Winberg portray the original authors of this true story, Frank Gilbreth and Ernestine Gilbreth Carey. Alternately, they serve as stage-side narrators of the flashback action, and then jump right into the play as it goes back in time to tell the pleasantly poignant tale of a very big family (12 children), along with the ups and downs of parental demands and sibling rivalries that punctuate such a busy household. While the ending is somewhat bittersweet, there is great fun along the way. Experienced actor, Katt Gilcrease, gives a fine portrayal of the father, Mr. Gilbreth. (Gilcrease appears in the forthcoming film, Tree of Life, starring Sean Penn and Brad Pitt, and scheduled for release next year). His performance here reminds us of yet another whistle-blowing disciplinary father, Captain Von Trapp, in The Sound of Music. The kids all jump when he blows that whistle, and his strict demands regarding schoolwork, proper dress, and time clock efficiencies for everything (including taking a bath) are beginning to wear on the children. This is especially true for the oldest daughter, Anne, sensitively played by Haley Baxter. The boys have their eye on her in spite of dad’s protective nature. Michael Cadwallader humorously plays Anne’s first suitor, a school cheerleader whose casual “Hi, Pops!” slang immediately puts him at comical odds with Mr. Gilbreth. When that doesn’t work out, we meet her next beau, Larry, in a sweetly shy portrayal from handsome, Connor Heaton. For added humor we have the Gilbreth’s feisty housekeeper, Mrs. Fitzgerald (cutely played for laughs by Melody Montez), and the snooty and officious school teacher, Miss Brill (Marcia Feldt Bates). The attractive and appealing cast of youngsters made me wish Stage Right might one day produce Richard Rodgers’ delightful final musical, “I Remember Mama.” This cast could do it very well. Playing more of the Gilbreth family’s sometimes devilish brothers are Russell Cadwallader (Bill), Mac Johnson (Dan), Austin Lyon (Fred), and adorable little Ian Montez (Jackie). Playing the last of the sweet sisters are Kaylie King (Lillian), and Amanda Roberts (Martha). And by the way, the family dog is perfectly cast with Harley Wong. Greg Kelly gives us a clean, bright middle-class living room set design on which the action can smoothly play out. The play’s lighting (Roger Ormiston / Tom Lockhart Jr.) used an interesting trick to take us back and forth in time. When our narrators are alone on stage reminiscing in the present, the lights dim. When they return in character to the flashback action of the play, the lights come up full. The technique worked very well. We come away from this pleasant evening of theatre with some family lessons worth remembering. Mr. Gilbreth emphasizes the importance of saving time so we can have that time “…for where your heart lies.” Mrs. Gilbreth offers her own bit of wisdom: “When we’re all together it’s the happiest time in the world.” Amen! Cheaper by the Dozen will play at Conroe’s Crighton Theatre thru August 16, 2009, with performances at 8 PM on Fridays and Saturdays, and 2 PM on Sundays. Call 936-441-SHOW (7469) for tickets and information.